Starting this fall a class at Duke University in Durham, NC will begin experimenting with the use of Apple iPads in student field research. 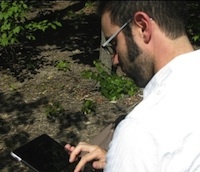 The Duke Global Health Institute will distribute the tablet devices in a master's course that introduces students to methodological techniques used in global health research. That university research currently spans 37 countries, from Bangladesh to Vietnam. Funding for the program is coming from Duke's Center for Instructional Technology. "Our primary goal is to equip our students with a toolset that allows them to make the most of their time in the field," said Associate Professor of Sociology Jen'nan Read, who will be teaching the class. "As calculation, graphing, and presentation-creation functions of the iPad are put to use in the field, so too is the ability for students to focus on mastering the more complex methods by which they are basing their research." "Traditionally, the more sophisticated learning, the kind that requires synthesis and evaluation, occurs after the students have left the field, after they have completed data entry, and only after they have begun to organize, interpret, compare and contrast, and summarize their data by retiring to a location with a laptop or desktop computer, like their home or office," said educational technologies consultant Marc Sperber, who is the main consultant for this project. "With an iPad a student may collect, organize and display data while in the field, allowing them to immediately engage in analyzing and interpreting that data when and where it has greatest meaning." The device has a (theoretical) 10-hour battery life and is expected to hold up well in the dusty environments where the research could be taking place. Last year, students used Cisco's Flip video cameras to conduct interviews. The iPads will be equipped with 3G and WiFi Internet access, as well as a variety of research and survey applications that can record and import multimedia interviews and photos, and collect, chart, evaluate, and present data. Although Sperber hasn't selected the specific applications he expects to load onto the iPads, he said they would be in the categories of research, reference, communication, and navigation. The project, which will have the students work in groups of three, will have eight iPads to share through the semester. Participants will be trained on the device and given a local fieldwork assignment to practice using them, with the goal of preparing them for the limitations they'll encounter when working in a remote, low-resource setting as part of their global health research project in summer 2011.